1. Do all my MA pre-reading- Done! I am so pleased I managed to get all of it done, go me! 2. Paint and redecorate my room- Sadly I haven't had the time to do this one yet but hopeful I will get to soon. 3. Eat more fruit and vegetables- I am so proud of how many fruit and veggies I have been eating lately. 4. Organise my makeup and throw out empty products- Done and done! 5. Start saving money for Christmas- I've opened up a separate savings account just for this and put away some money, yay! 1. Start food prepping- Yep I am going to be one of those people with their tupperware with all their food prepared. Well here's hoping! 2. Save more money for Christmas and buy a few presents- I hate leaving Christmas shopping to the last minute so I want to buy presents in bits so I don't have to do it all at once. 3. Do some Autumn themed DIYs and share them on the blog- I love DIYs with Autumnal themes and I really want to share them with you. 4. Henna my hair- I haven't henna-ed (is that a word?) my hair since I was 14 or something but I always loved how it looks. My roots are atrocious but I want to dye my hair with something natural. So there are my goals for October, there aren't too many so hopefully I'll manage to do them all. 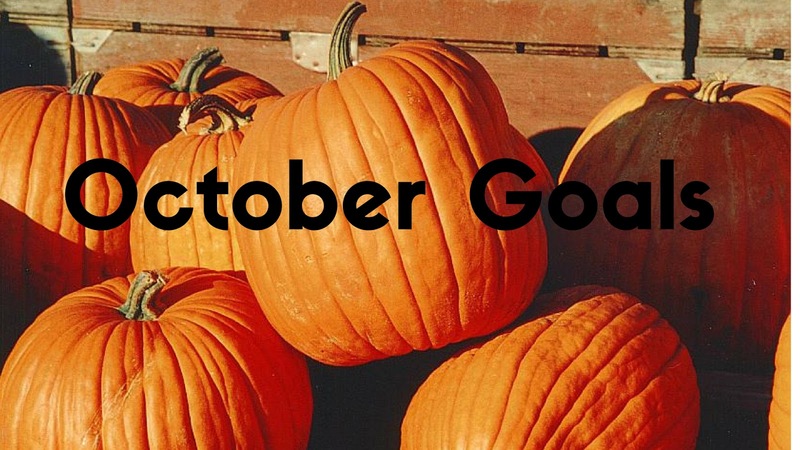 I hope you enjoyed reading this post, what are your goals for October? Do you share any of my goals? OO I look forward to seeing them, fingers crossed you manage to get them up! Thanks for popping in! I started last night and it is going OK, so fingers crossed I'll be able to keep it up! Thanks for stopping by!